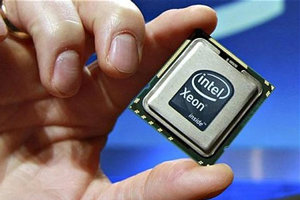 Apple (s aapl) “helps shape” Intel’s road map, according to Intel (s intc) SVP Tom Kilroy. Kilroy told Reuters (s tri) that the iPad and Apple’s other successes play a big role in how Intel thinks about the future of computing devices and the chips that power them, at the news organization’s Global Technology Summit in New York City on Wednesday. Go look at the performance of those platforms. They’re taking our latest and high-end end versions of second-generation core, and ARM doesn’t even come close to any capability there. He wouldn’t go so far as to guarantee that Intel will be included in future MacBook products, but obviously that’s not something Apple would ever allow a manufacturing partner to do, even if a deal was in fact in place. Meanwhile, at Intel’s annual investor day yesterday, CEO Paul Otellini addressed the perception that Intel is losing the mobile processing game by pointing out that his company still makes the most money on smartphones and tablets today. He says (via Barron’s) that’s because “the money is in the infrastructure,” and Intel is still very much the leader in supplying data-center oriented processors, which are in high demand to support connected mobile devices. Otellini also brought up Intel’s role as a chip foundry, noting, “[i]f you look at the profitability around the smartphone chips, it’s mostly going to the foundry guys.” Intel is reportedly interested in becoming a foundry partner for Apple, which seems to want to expand beyond its main processor supplier for the iPad, Samsung. Samsung is arguably Apple’s most significant hardware competitor when it comes to mobile devices, thanks to the successful Galaxy line of smartphones and tablets. Apple just unveiled new iMacs featuring the Intel Sandy Bridge line of processors, and the company is expected to release similarly equipped MacBook Air notebooks soon. According to all the obvious signs, the relationship between Apple and Intel has never been tighter. Intel could do far worse than hitch its mobile hopes to Apple’s wagon, and between Apple’s NC data center and a foundry deal, it would certainly be doing just that.